Time and again, I find myself drawn to books I have fond childhood memories of but other than that, can't remember a thing about them. Such is the case with Mrs. Piggle-Wiggle. I can't see the cover without instantly being back on my parents' bed, reading by the glow of the reading lights that were attached to the top of their headboard. I know my mom also read these books aloud but my most vivid memories are of me re-reading them by myself. Lucky for me, now when I have a desire to stroll down memory lane, I drag my kids along with me. Mrs. Piggle-Wiggle is the ideal grandma...times ten. Although she never had any children of her own (and therefore, not any real grandchildren either), she has loved and been loved by hundreds of neighborhood kids over the years. She lets them dig up buried treasure in the backyard, wear her high heels around the house, and fix her hair in a plethora of "fashionable" styles. But besides being incredibly keen with what children will like, Mrs. Piggle-Wiggle also knows exactly how to make them behave...and how to cure all their bad habits. So it is that all the neighborhood mothers come to Mrs. Piggle-Wiggle with their most challenging discipline problems. I don't know why I thought I needed to read a parenting book to recharge my parenting battery; Mrs. Piggle-Wiggle already had all the answers! If my children won't take a bath, then I should just stop forcing them and wait until they are so dirty I can plant radish seeds all over them. If they're being selfish with their possessions, then I should promptly label and lock up every single thing that belongs to them (including toothbrushes, sandwiches, and socks). And if they refuse to pick up their toys, then the solution rests in not picking up anything until their room is so messy, they've essentially trapped themselves in, at which point I should pierce their dinner onto a garden rake and squeeze it through the window so that they won't starve. Mrs. Piggle-Wiggle seems to be of the school, "Let your kids reap their own consequences (i.e., the consequence of having a room so cluttered you literally can't walk through it and let yourself out--never mind the fire hazard), and soon enough, they will decide to mend their ways." And to a certain extent, I can't say I disagree with her. Certainly letting kids learn the "hard way" before it's really the hard way is the most memorable and longest-lasting. But honestly, radishes? That cure was just too much for me even though it was one of the most entertaining. One of the later books is Mrs. Piggle-Wiggle's Magic, and I think I must be remembering that book better than the rest because when I was reading this one to Aaron and Max, I kept expecting her cures to involve magic, and not a one of them does. Instead, these are all cures you could theoretically duplicate at home, although not without a lot of pain and difficulty on your part. Aaron and Maxwell liked Mrs. Piggle-Wiggle well enough. Some of the chapters they found uproariously funny, particularly the one with the back-talking parrot (and I was just hoping I wouldn't hear "I'll do it because I want to but not because you tell me to" the next day). Each chapter follows a very predictable pattern: introduction of the problem behavior (ex. 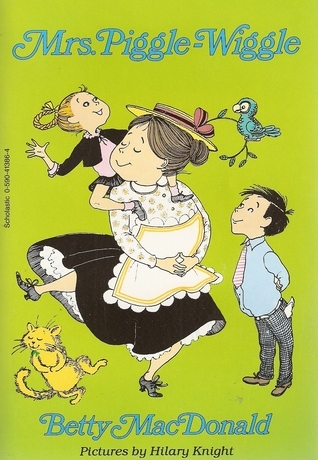 Joan and Anne are bickering constantly); the mother calls all her friends for advice (the father is usually next to no help); finally, someone suggests calling Mrs. Piggle-Wiggle; of course Mrs. Piggle-Wiggle has cured a dozen just such cases and gives detailed instructions; the mother follows the instructions to the letter, even if it means starving her beloved child (see Chapter 7, "The Slow-Eater-Tiny-Bite-Taker Cure," which maybe was a problem in the 40's, but I have never heard of any child doing such a thing in the present day); after a few days (or weeks), the child is cured and normal life resumes. The end. Aaron and Max loved the predictability. After the opening scene of each chapter, I would ask, "Now what is the mom going to do?" "Call her friends!" Aaron would say, and sure enough, in the next paragraph, she'd be calling Mrs. Grassfeather or Mrs. Gardenfield (these friends all had the strangest names). I, on the other hand, found the unyielding predictability a little tedious. My main complaint though was with the ending mainly because there was, um, no ending. Period. The final chapter is about Joan and Anne and their constant quarreling, and the chapter (and the book) concludes with, "The Fighter-Quarreleritis was cured." There wasn't a final shout-out to Mrs. Piggle-Wiggle, no allusion to her continuing to help and love all children, and no summary of all the great works she'd already done. It ended exactly like every other chapter before it had ended, and it left me with a very unfinished feeling. One last heads-up: it is very much a book from the 1940's, which means a lot of aproned homemakers, well-mannered children, and of course, the dreaded physical punishment (i.e. spanking). Several of the parents mention this (usually with a trace of humor), but some modern parents might not find this so funny. Personally, I am not a spanker (although I can't say there haven't been moments when I've wanted to), but I didn't mind this being a part of the story. Anyway, for just some good, ol' fashioned fun and some really outlandish parenting solutions, I think you'd enjoy Mrs. Piggle-Wiggle. I'm sharing this post with The Children's Bookshelf and the Kid Lit Blog Hop. These were some of my favorite books to check out from the library when I was in elementary school! I LOVED these books as a kid. And still think about them quite often. I am ashamed to admit that I've never read this book. But I really, really need to! I can't wait to explore these one day with Baby Whimsy. Oddly enough, I don't remember this book at all but I most definitely remember the radishes and the food on a rake, so I must have read this as a kid! You've brought back some happy memories, thank you. I'll definitely have to look this one up again for old times' sake. I absolutely adored these books when I was growing up. Mrs. Piggle-Wiggle is the best! I LOVED these books when I was a kid. I haven't thought about them in years. Thanks! My kids loved this book when I read it out loud to them. What a great review! Thanks for sharing at The Children's Bookshelf. Also, I noticed you were on Google +. I hope you consider joining the Great Books for Kids community -- you'd add a lot to the conversation! Erica- I have to admit, I know nothing about Google+, which is why I haven't joined anything yet! I just need to devote some time so I can learn the ropes, and then you can be sure I'll be participating! I'm so glad I've run across your detailed review. I can't remember reading this book as a child, and I must admit that I haven't read it to my kids. But, that being said, we've reviewed a book by an author who cites this book as her inspiration, Tall Tales With Mr. K by Kathy Rygg. Fabulous book and concept. Renee - Thanks so much! And thanks for the book recommendation. I'm going to put that on our list of future books to read! I haven't met Mrs Piggle-Wiggle yet but now really want to! Betty MacDonald and Mrs. Piggle-Wiggle are beloved all over the world.